Participants in the 2016 Jacksonport Polar Bear Plunge. Photo by Len Villano. J.R. Jarosh may have found a way to have his cake and eat it, too. 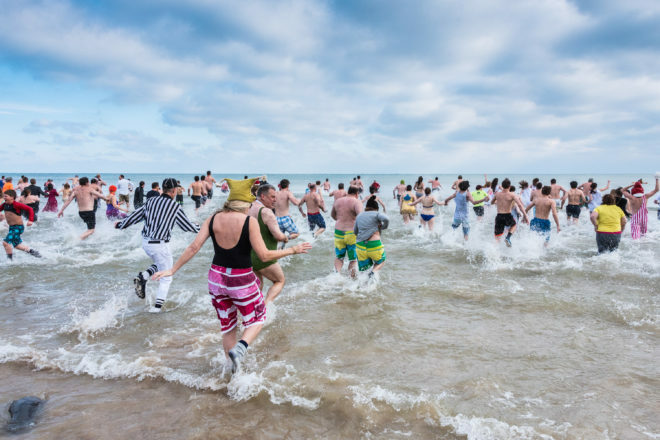 At this year’s 31st annual Jacksonport Polar Bear Plunge, participants are invited to come dressed in 1980s-themed costumes. Jarosh, the founder of the plunge, famously takes his annual New Year’s Day dip in a tuxedo. So he is considering coming as Pierce Brosnan, who often wore a tuxedo in the 1982-87 TV series Remington Steele. “I’m kind of locked in with the tux, but my kids are going in this year, so I was thinking of switching it up and going in concert with whatever they are wearing, but they’re still waffling, so for now it’s the tux,” Jarosh said. Having his 10-year-old twin daughters, Abby and Anna, join him this year is going to be a highlight in the three decades of polar plunges Jarosh has taken, to go alongside a couple of other frozen-in-time memories. “I think the first year my wife – or at that time, my girlfriend – went in was pretty cool,” he said. “Her parents told me how she absolutely hated the cold and there was no way she is going in the water. So when she did, I thought, wow, this could work out. Jarosh is also thinking the planets have aligned to make this a record year for participants. Jarosh said he is also excited to have newly designed t-shirts and hats to sell, with profits going to the Jacksonport Fire Department. Jarosh said he always gets amped up for the plunge, but having his girls join him brings it to a new level. The Jacksonport Polar Bear Plunge begins at noon at Lakeside Park, the same time as the Bi-Polar Plunge at Waterfront Mary’s in Sturgeon Bay. Kylie Pagel, office manager for the associated Beach Harbor Resort, said depending on conditions, they either cut a hole in the ice or just break up ice that has formed along the beach. She mentioned that Beach Harbor is offering “Don’t Drink and Drive” rooms on New Year’s Eve, starting at $45, for those who want to start the party early.